Going to school can be hard. Going to a school for the magically gifted can be downright dangerous. You and your classmates are young, gifted students at Eggelstein Hall, better known to the students as Alchemist Academy. You haven't been paying attention to your studies and with only a few days left in the semester you need to raise your grades, and fast! There is only one solution at this school: ...if you can't pass... CAST! 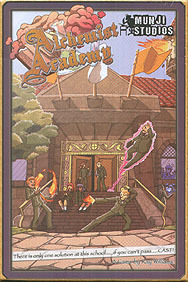 Alchemist Academy is a fast, light-hearted card game for 2 to 6 players with 24 different spells to cast and a wide range of familiars to call upon, each with their own unique ability. So whether you want to turn yourself invisible, mimic another person's abilities, or just cast a spell of ultimate evil upon everyone at the table, there is no time to waste! Grab whatever components are on hand and pray you know a spell that needs them!